Born Feb. 22, 1732, near Bridges Creek, Virginia; died Dec. 14, 1799, in Mount Vernon. American statesman, commander in chief of the American Army during the War of Independence in North America (1775-83), and first president ofthe USA (1789-97). Washington was born into the family of a rich planter and slave owner. At the age of 15 he finished his education, and at the age of 16 he began to work as a surveyor. In 1751 he inherited the large estate of Mount Vernon and became a shareholder in the Ohio Company, which speculated in lands seized from the Indians. At the same time, Washington received the rank of major and was appointed the commander of one of the four districts of the Virginia militia. In 1755 he took part in the unsuccessful expedition to the French fort of Duquesne. At the beginning of the Seven Years’ War (1756-63), Washington, now a colonel, commanded the troops of Virginia. In 1759 he resigned. As a member of the Virginia House of Burgesses and judge of Fairfax County, Washington actively protested against the British government’s policy of limiting trade and industry in the colonies. In 1774, Washington was elected to the First Continental Congress and in 1775 to the Second Continental Congress. At the very beginning of the war for independence of the English colonies in North America (a bourgeois revolution), the congress chose Washington as commander in chief of the rebel armed forces (June 15, 1775). In this position Washington displayed high moral qualities, courage, determination, and talent as a military leader and organizer. The congress repeatedly gave Washington broad and even dictatorial powers. Washington enjoyed popularity among the popular masses whose struggle made possible the triumph of the revolution. At the end of the war a group of reactionary officers organized a monarchical conspiracy and offered Washington the crown. He rejected this proposition. After the end of the war Washington retired to his estate. In the years 1786-87, Washington headed the reactionary forces which crushed the democratic movement of poor farmers and artisans under the leadership of D. Shays (Shays’ Rebellion). In 1787, under Washington’s chairmanship, the Constitution of the USA was drafted. With certain changes this constitution is still in effect today. 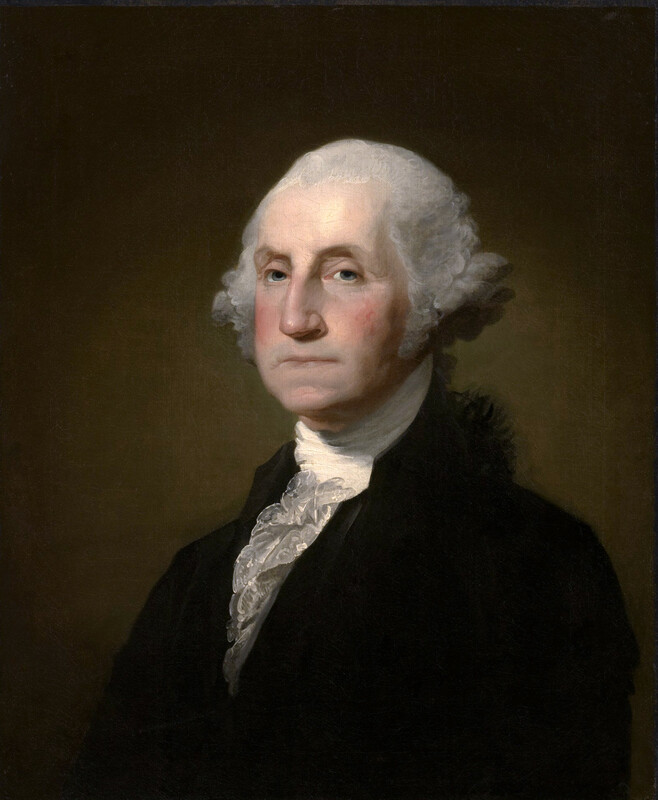 In 1789, Washington was elected the first president of the USA (reelected in 1792). Carrying out a conservative policy, Washington opposed the democratic demands of the popular masses, consolidating only those achievements of the revolution which were necessary to the bourgeoisie and the planters. Although he included both Federalists and their opponent T. Jefferson in his cabinet, Washington nevertheless supported and in fact headed the Federalists with their centralizing and anglophile tendencies. Washington was one of the founders of the two-party system of the USA. He welcomed the beginning of the Great French Revolution, but its subsequent development frightened him. After the outbreak of war between revolutionary France and the European coalition in 1793, Washington refused to fulfill the obligations which the USA had as an ally, according to the French Alliance of 1778. Later,Washington favored American refusal to participate in alliances of and wars between the European states. Washington supported the inequitable treaty with Great Britain (the so-called Jay’s Treaty) concluded in 1794 which caused much indignation in the USA and undermined Washington’s popularity. Washington spent the last years of his life in Mount Vernon. He was a proponent of the gradual abolition of slavery, and in his will he freed all slaves belonging to him personally. Washington has gone down in history as a progressive figure, since he occupied a consistent position on the most important issue of the American bourgeois revolution of the 18th century—the struggle for independence of the colonies. At the same time, he remained a representative of the interests of the propertied classes, and in this lies Washington’s limitation: he was a bourgeois revolutionary. The Writings, vols. 1-14. New York, 1889-93. The Diaries, 1748-1799, vols. 1-4. New York . Lenin, V. I. “Pis’mo k amerikanskim rabochim.” Poln. sobr. soch., 5th ed., vol. 37. Efimov, A. V. SShA: Puti razvitiia kapitalizma. Moscow, 1969. This entry was posted in Anti-Imperialism, Armed Struggle, Bourgeois Revolutionaries, British Imperialism, Capitalism & Bourgeois Liberalism, Class Struggle, History, Imperialism & Colonialism, Internationalism, North America, Theory, United States. Bookmark the permalink.